Today the U.S. Supreme Court issued its decision on the Janus vs. AFSCME case, stating that public-sector unions’ fair share fees, collected from employees who decline to join a union but still benefit from their negotiations, are unconstitutional. The decision will essentially bring “right to work” to public sector workers across America. “As a former union organizer – serving my sisters and brothers in labor for more than 25 years – today’s Supreme Court decision is devastating. It is a major blow to working people and will undoubtedly weaken the middle class across America. “This misguided, wrong-headed decision will impact our communities the hardest, making ‘right to work’ the law of the land for our public servants – our police officers, fire fighters, teachers, nurses and more. That means lower wages, fewer opportunities for women and people of color and more dangerous workplaces. “This decision is a culmination of nearly 40 years of strategic, anti-worker efforts to undermine unions and prioritize corporations. Just like Citizens United, this case extends the dangerous idea that money is speech. “Unions built the middle class in America and they’ve played an essential role in protecting working people. As lawmakers, it’s now our responsibility to defend the voices of Ohio workers who protect us, educate our children and serve our communities. “This ruling in favor of Janus is a ruling against our communities, affecting the collective bargaining rights of some of our most respected professionals, including teachers, nurses, firefighters and police officers. Unions provide a path to the middle class and advocate for equal opportunities for all. This decision means lower wages, fewer opportunities for women and people of color and more dangerous workplaces. “Today’s Supreme Court ruling is devastating for workers in Ohio and all across America. As a former police officer, I know firsthand that the ability to collectively bargain for safe working conditions and fair wages is a powerful and important tool. When the court decides to restrict that tool, a power imbalance is created that overwhelmingly and negatively impacts workers. 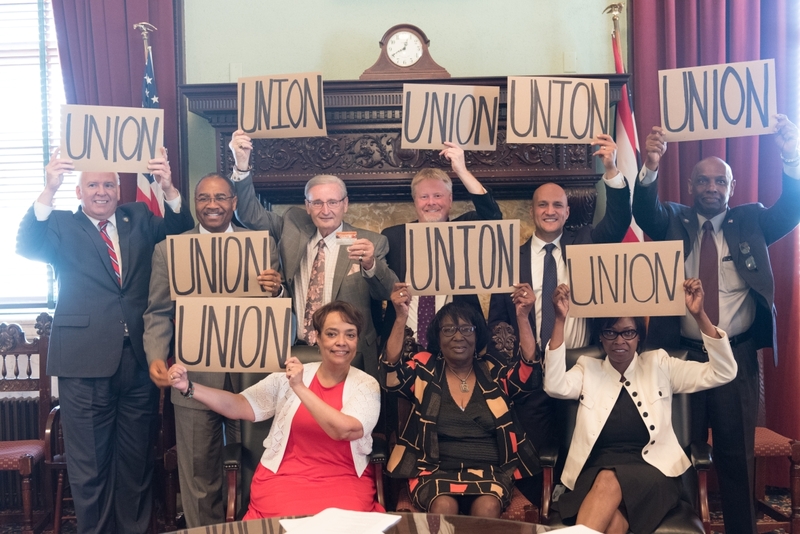 “Despite this setback, I will continue to stand strong with our labor partners to defend the voices of the Ohio workers who protect us, educate our children and serve our communities." “This ruling will set us back decades when it comes to workers’ rights in our country. Today will forever be remembered as one where the interests of a few triumphed over the rights of many. “Union representation provides workers a living wage, safe working conditions and a pathway to the middle class. Janus was not a grassroots effort by everyday people. This decision is a direct and strategic attack on organized labor, and it will affect our local communities members the most, including our teachers, nurses, firefighters and police officers. “Today’s U.S. Supreme Court decision in Janus vs. AFSCME is but another blow to working families led by a corporate-funded agenda. The decision further rigs the economy against working families to benefit CEOs and large corporations. The result will be lower wages and a weakening of the rights of workers. “When the first right-to-work effort came to Ohio in 1958, as Amendment 2, and proposed changes to Ohio’s Constitution, it was defeated by nearly a two-to-one vote. The second major attack on workers’ rights occurred in 2011 with the passage of Senate Bill 5 in the Republican-led Ohio General Assembly, which was overwhelmingly repealed by Ohio voters. Unsuccessful at the ballot box in Ohio and elsewhere, corporate interests have now been successful legislating from the bench.